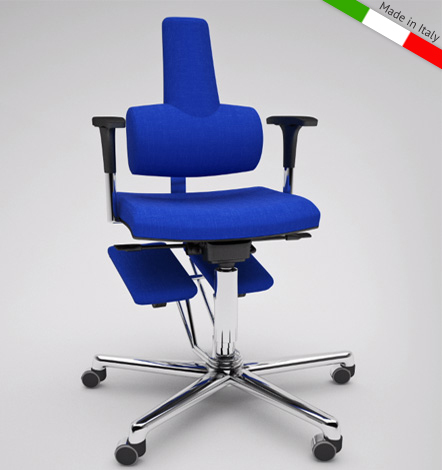 It has been proved that spending many hours sitting at the desk without a proper lumbar back support, decreases the trunk-thigh angle and causes a consequent flattening of the lumbar curve. This is why most of the people working on offices suffer of lumbar back pain. 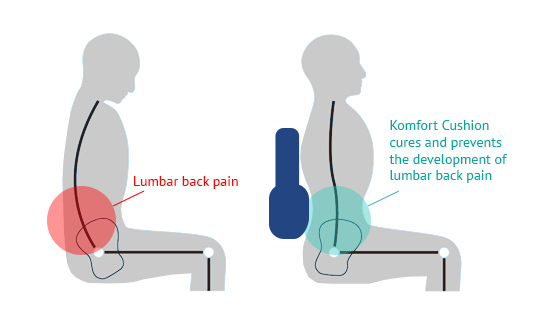 Komfort Cushion cures and prevents the development of lumbar back pain. Thanks to its ergonomic shape, it works as a lumbar support cushion restoring the normal curves of the spine, correcting the deformations of the vertebral column’s soft tissues and stopping the developing of painful lumbar pathologies. In addition Komfort Cushion helps abdomen and chest to relax. Thanks to its action on the lumbar muscles this body support the cushion deletes the annoying feeling of indigestion, abdominal heaviness, short breathing and chest pain sensations that often afflict who works long time in a sitting position. Komfort Cushion is also very versatile: it has special adjustable stripes that allow to use it as a lumbar cushion for chairs or like a back support in your car. That’s why this back support device is perfect for all those subjects at risk of developing low-back pain, like office workers, drivers and students. Buy now your Komfort Cushion and get rid of lower back pain.